Home bar decoration is very much a matter of personal taste. Some people go all out and decorate their bar with huge dedication, collecting bar decorations and novelties wherever they go. Others choose not to decorate at all or very little. 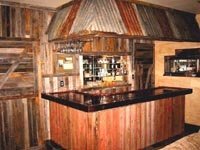 This guide is aimed at giving you some inspiration when thinking of the theme you want your home bar to have. The various liquor bottles and glasses when arranged on back and side shelves, serve as nice decorations already, but there is and endless list of themes to choose from. The home bar decorations and theme goes hand in hand. You don’t have to decorate according to a theme, but if you have a theme you will likely decorate accordingly – a themed bar comes to its right through the decorations. Ø	Sports teams. In the UK, soccer teams like Man United in particular. In the US, often NFL, NHL or NBL teams. Ø	Race car teams like Formula 1 teams are also popular, in particular Ferrari. A NASCAR themed bar is also a popular choice. Ø	Tiki or tropical bar - an island style bar. This is a popular choice these days. Palm leaves, totem poles and actual sea sand on the floor are popular decorations. Ø	Club/disco. Bright and colourful lights, like lava lamps or neon signs, should be used plentyfully. Ø	California Style. How about an old surf board against the wall. Ø	New Orleans Style. This incorporates a blues or jazz feel. Ø	Las Vegas Style. Think poker and black jack tables and slot machines. A variation on the theme is “Rat Pack”. For this you can put up classic black and white posters against the walls. Ø	20’s, 30’s, 40’s, 50’s, 60’s, 70’s, 80’s…. Ø	Billiards. A pool table is a must of course. Decorations according to themes can be found at specialized bar stores on (and off) line. Decide on a 3 or 4 possible themes and then research the availability of decorations and importantly costs. Some home bar decoration items can be very pricey, like Ferrari memorabilia for example. Decide on the most appropriate theme based on your research. It is important that you establish what furniture is available and again what these cost. Your furniture, particularly bar stools, need to fit in with your theme. 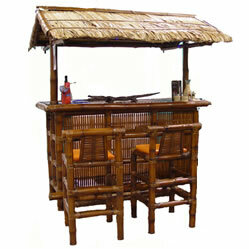 See our Home Bar Furniture Guide for more on home bar furniture. Ø	Draught beer dispensers (aka draft beer system), usually made of metal. This is a very nice item – it dispenses draught beer – and looks nice as well. Note that we need to have a keg cooler fitted underneath your bar. Getting hold of this and having this refilled may be a problem in some places, not being available or only being available at a high price. Ø	Mirrors and wall clocks with printed liquor labels e.g. Jack Daniels and J&B. Strategically placed mirrors (at the back of the bar for example) of course helps to let the bar look bigger than it is. Ø	Flags of various countries, clans, sports teams, etc. Ø	Caps – this is a popular one. You often see bars decorated with 10’s or even hundreds of caps from across the world, often with humorous prints on. As your bar grows older, the more decorations you are likely to collect and the more character your bar will get. People will also tend to give you decorations as gifts. This is of course a good option to give people if they ask what you want for your birthday/Christmas.